A journey from San Diego to Brownsville offers an up-close view into what it would actually take to complete Donald Trump's proposed wall along the U.S.-Mexico border. Donald Trump has made no secret of his plan to build a wall along the entire U.S.-Mexico border — and persuade Mexico to pay for it. The Republican nominee has been remarkably vocal about the proposal, one that 6 in 10 voters disagree with. The wall, he argues, is needed to curb illegal immigration, reduce gang violence near the border and stop drugs from reaching the United States. For now, fences cover just 700 miles of the nearly 2,000-mile-long border. Hillary Clinton, the Democratic nominee, opposes completing the wall — but as a senator, she voted for the 2006 bill that led to construction of most of the existing fence. The idea of "completing the wall" has been part of political rhetoric since construction of the fence began. But now, a decade after the majority of the fence was built, opinions are divided on whether a barrier spanning the entire border is necessary — or even feasible. Mara Kiska, a San Diego resident, says, "Well, have you seen the wall? It's like you could hop over it. It's like a joke. It's a joke." De Le, also a San Diego resident, says, "Right now, we have a fence. But a fence can be cut. But I would rather have a solid wall. A solid concrete wall. The entire border needs to be walled off from California all the way up to Texas. Illegal immigration is a drain to America, and they are doing nothing but bringing this country down. And look at them, they come here — they mostly uneducated, they commit a lot of crime, they are low-class people. They're trash. Let's build a wall, a fence, whatever. Let's keep illegals out. I cannot wait to be walking down the street and see American faces again for a change. They might call me racist. I don't care." Some Mexicans worry the rhetoric surrounding the border wall debate will worsen relations between the two nations. Dalton Ramirez, who makes pinatas of Donald Trump in Reynosa, Mexico, thinks Trump's rhetoric provokes racism. "That border wall, it sounds ridiculous to me. Even more when I hear that we are going to pay for that. It's talk of war. It's like going back to ancient times. I think they are just words he says. But who knows? If he is elected, maybe he'll do it. The U.S. and Mexican economies are deeply intertwined. This can be seen clearly in the agricultural communities along the border. Scott McWilliams owns Val Verde Wool and Mohair in Del Rio, a place that remains mostly unfenced and where ranchers from both nations come together to do business. "A high percentage of our retail business comes from Mexico. So we have a great relationship with the ranching community over there as well as here. If the wall was built, that might stop some of the drug traffic from coming through their ranches before they get to our ranches. So it could be a positive for them as well. It would have to be such a wall and monitored in such a way that it actually worked, but I've seen fences built in this country in places you wouldn't imagine you could build one, and they managed to do it." Some locals stress the enormous logistical challenges of building a wall. The Lake Amistad in Texas is just one example of the rough terrain. Mile by mile, the landscape and culture along the border vary wildly. West of El Paso, through New Mexico, Arizona and California, where most of the existing fence has been built, the border is largely a series of straight lines drawn by men. But to the east, in Texas, it follows the winding path of the Rio Grande. Most of the border land here is still unfenced. Barrier construction in this area would be difficult because of the region's isolation and rough terrain. The federal government owns very little land in Texas, so a bigger fence would require the use of private land, adding to the legal and logistical challenges. But most challenging of all, the Rio Grande is a natural feature — not a man-made boundary. Rivers erode the land they pass. They flood. They dry up. They sometimes change course. A completed border barrier would have to navigate these natural challenges. Near the mouth of the Rio Grande lie the twin towns of Matamoros, Mexico, and Brownsville, Texas. Here, the land is remarkably lush, the river winding and prone to flooding. The United States and Mexico have had multiple disputes over land affected when the river has changed course. Border fencing is sporadic here. Where fencing does exist, it often sits far from the river, outside its flood plains - creating wide seams between the fence and the official border. Jeremy Barnard, general manager of a golf resort, worries that his business would be walled off from the United States if the barrier is completed. "There's about 200 residents on the south side of the levy that would be displaced if you built the wall right here on this levy. They'd be cut off from America and be in a no-man's land. A lot of people just assume the wall would be built right here at the edge, and that's not true. There's lots of people and communities that would be affected in a different way." For some, living in these seams is already a reality. Construction of the existing barrier impacted hundreds of landowners. Farms and farmland were fenced out. Important wildlife sanctuaries were fragmented. Eloisa Tamez, Lipan Apache civil rights leader in Brownsville, says, "This is my indigenous land. This is where all my ancestors have come from. That's where I was born, right here. That's not the original house, but that right there is where I was born and raised. The property extends onto the other side of the levy. I requested direct access. They denied it. By not having direct access to my property to see how things are on the other side, I have to go 1,200 feet to the east, or twice that length to the west. And now there's a gate there. ... If they took the land to build this wall, what is the benefit? Have we seen the benefit? Has it done anything to prevent the drug trafficking or the so-called undocumented coming through?" Whether the existing barrier has achieved its goals is up for debate. Fencing is just one part of the effort by U.S. Customs and Border Protection (CBP) to secure the country's borders. The number of Border Patrol officers has doubled in recent years. Where no fencing exists, cameras and sensors do. Data released by CBP suggests that illegal immigration has decreased since 2001, but it's difficult to show which specific policies made a difference. The Great Recession, which began in 2008, almost certainly deterred some economic migrants, researchers say. One consequence of tightened border security policies is that routes for migrants - many of whom are Central Americans, not Mexicans — have become more dangerous. Today, most deaths reported by Border Patrol officials occur in the Rio Grande Valley in Texas, where most of the border remains unfenced, and in the Tucson, Arizona, area, which is mostly fenced. 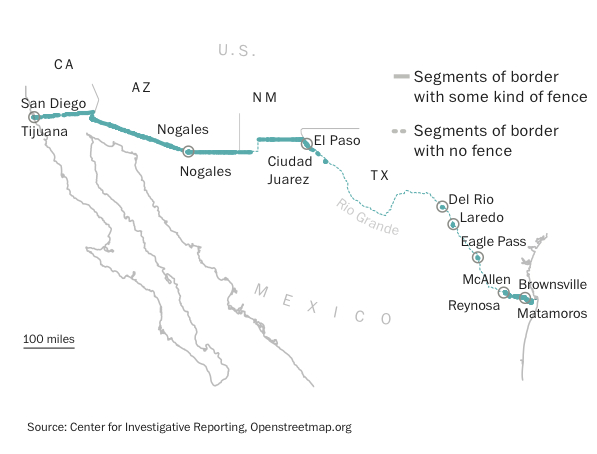 Border enforcement has pushed migrants off existing routes into more deserted areas. In southern Arizona, migrants walk dozens of miles through the desert, carrying water in plastic jugs. "Dinah Bear, president of Humane Borders, says, "People are dying out here. We've had around 3,000 confirmed migrant deaths in southern Arizona. We know that we're going to be finding bodies for years, for decades. As the border wall has gone up in various areas of the border, it's moved people into more remote areas. We have seen a baby who is still alive who was trying to nurse from its mother, who was dead. We have had a 1-year-old die. Several of our volunteers have found dead bodies." Tucson is one of the most challenging places to attempt a border crossing. In 2015, the Border Patrol had more than 790 rescues in the Tucson sector. The death rate is one of the highest along the border. Immigration is a complicated issue; a barrier along the border addresses just one part of it. An estimated 12 million undocumented immigrants already live in the United States, representing 5 percent of the labor force. Emma Sanchez embodies the intertwined nature of border protection and immigration policy. She is married to a U.S. veteran and has two American children but was deported 10 years ago after being found without documents. Every Sunday, dozens of deported mothers like her meet for a church service at Friendship Park, the only binational meeting place between the United States and Mexico. Situated at the west end of the border, on the coast of the Pacific Ocean between San Diego and Tijuana, the park provides divided families a chance to catch up with their loved ones — if only for a few hours, and only through an 18-foot-tall steel and mesh fence. "We're a group of moms," says Sanchez. "We're all deported moms, repatriated moms. I didn't kill anyone, I didn't steal. I didn't commit a big offense. My only crime was staying in the country without documents, going into the country without documents. That was my crime." Araeli Sanchez, Emma's sister, who lives on the American side, says "I think it's sad that we have to look at each other through a wall. And it's heartbreaking because I'm there right there and my dad is right there and I can't give him a hug or I can't give him a kiss. The pinkie finger is the only one that goes through the little holes, and that's the only way we can touch each other." Emma Sanchez: "It's very hard to see these little persons and not being able to embrace them, see my little niece and not being able to embrace her. Hear her saying she wants to come to the house, and knowing that she can't come to the house, that I can't bring her, that it isn't something possible. I think it's like prison, jail, the way that they put these walls here. This wall is something really painful. It is inhumane." Apprehension of families and unaccompanied children surged again along the Texas-Mexico border in 2016, reflecting the new prevalence of illegal immigration from Central America. Meet some of the Central Americans who are fleeing violence and abject poverty at home, only to endure shakedowns and abuse on their way to an uncertain future in the United States. Former Texas Gov. Rick Perry has shot down Donald Trump's proposal to build a wall along the U.S.-Mexican border.